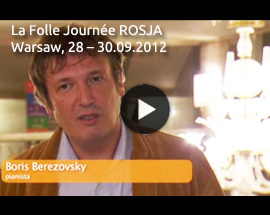 “La Folle Journée RUSSIA” is the third edition of the international La Folle Journée festival, founded and managed by its artistic director, René Martin. The first festival took place in Nantes, France, in 1995. Soon, annual editions of the festival moved to Portugal, Spain, Japan, Brazil and Poland. The festival’s most important premise and greatest challenge is to overcome the common stereotype of the inaccessibility of classical music by encouraging and facilitating the participation of a large audience in concerts, while providing a high level of performance. 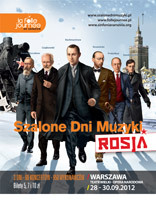 This is assured by the choice of works and by the participation of Polish and foreign artists in the project. The previous Warsaw editions of La Folle Journée were devoted to the music of Chopin (“Chopin Open” in 2010) and Brahms, Mahler, Liszt, Strauss and Szymanowski (“Les Titans” in 2011). Each time, approximately 100 concerts performed by hundreds of artists from more than a dozen countries around the world were attended by more than 26 000 listeners. 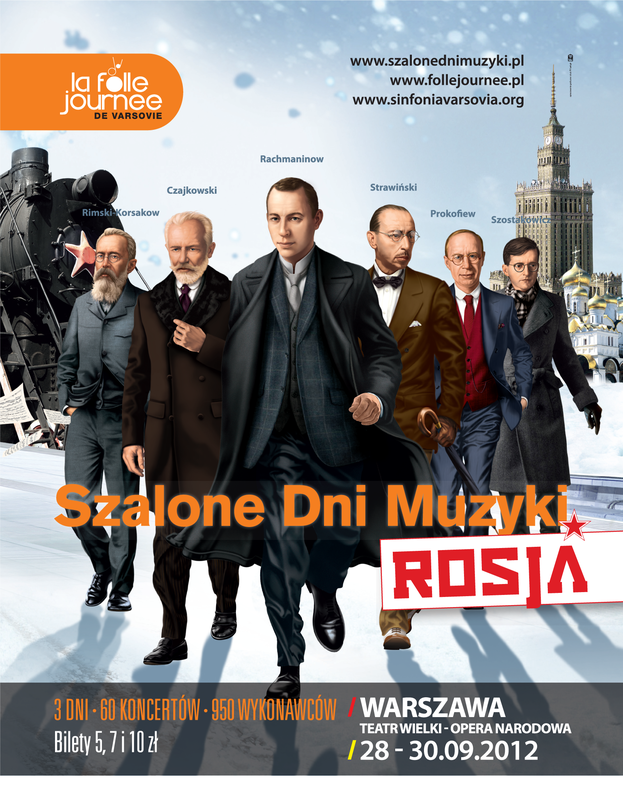 The third Polish edition of the international La Folle Journée festival – “RUSSIA” will be devoted to Russian music, represented mainly by the works of Rimsky-Korsakov, Tchaikovsky, Rachmaninov, Stravinsky, Prokofiev and Shostakovich. This year there are 60 concerts planned, featuring approximately 950 artists from around the world. Apart from performances by musicians of worldwide renown there will also be special concerts performed by young musicians and by the best ensembles from Polish music schools. Furthermore, the festival will feature music education programs for children, youths and music teachers, as well as “Smykofonia” – programs for pregnant women and babies. The concerts of this year’s edition of La Folle Journée will be held over three days, from morning till night, simultaneously in several halls of the Grand Theatre – National Opera and in a concert tent set up in the Theatre Square. Each concert lasts around one hour, with an admission price of only 5, 7 or 10 złoty. These two aspects – an accessible ticket price and length – are a significant facilitation to encourage a large audience to attend the festival. For many listeners, the festival is their first encounter with classical music and often the beginning of a wonderful adventure and a new fascination.